Tooling: We have the best craftsmen and carpenters in the business! With a combined 350 years experience in wood craftsmanship, carpentry, construction and virtually every type of craftsmanship you can think of; chances are our Tooling shop has seen or built it before. With a department resume that reads like a who's who of the carpentry business we are inclined to brag a little on the quality of the tooling we can produce. Typically only a few shops in the world can do the hard-to-build and the extremely custom work. Ours is always at the top of the list. Working with drafters, artists and production crews the Tooling shop is always coming up with creative solutions to making toolings that produce the highest quality of stone. 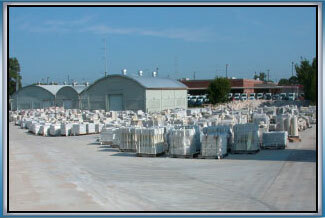 Photo Below: We have over 16K stock part toolings on hand. This Tooling selection ensures speedy delivery! Details: It is all about the Tooling, Stone demands it! 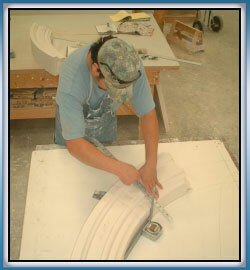 Making fine cast stone products begins with making precise toolings. Our craftsmen start by taking CAD drawings and working with them to determine what will work to produce the stone. Understanding the production process is a must. Each curve; decorative detail; and artwork might require the tooling to be built from a certain material. Often our Tooling shop has creatively approached this to develop new methods and/or materials for making Tooling for complex cast stone parts. Many of our toolings require intricate positioning for installation and our carpenters often provide frames and installation plates to make installation a snap. 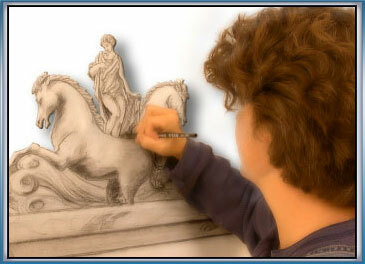 Artist working from Customer sketches producing fine details.